At Wildrose Disposal, we make it simple and convenient for our customers to get the reliable garbage and waste collection and disposal services they need. With a simple telephone call, you can reserve a dumpster in your choice of sizes and order delivery at your location. We also provide hassle-free roll-off service and on-call pickup and drop-off services. All bins are of great quality, there are no contracts required and you will never pay a hidden fee. We offer bins and dumpsters in a variety of sizes to meet your needs in a wide range of applications, including construction cleanup, oil field waste, garbage and trash collection, and metal and cardboard recycling. 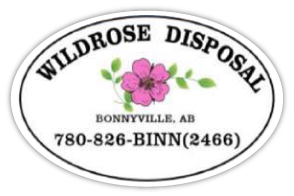 One of the advantages of using a locally based waste disposal company in Bonnyville is that we are on the scene, so response time is greatly reduced. You shouldn’t have to negotiate your way through call centres and subcontractors just to have your dumpster emptied, and when you call Wildrose Disposal, you won’t have to! We will respond to your call without delay. Contact us today to request a free quote at your home or business.